Twice the quests means twice the adventure for Zeus and his fellow Olympians. 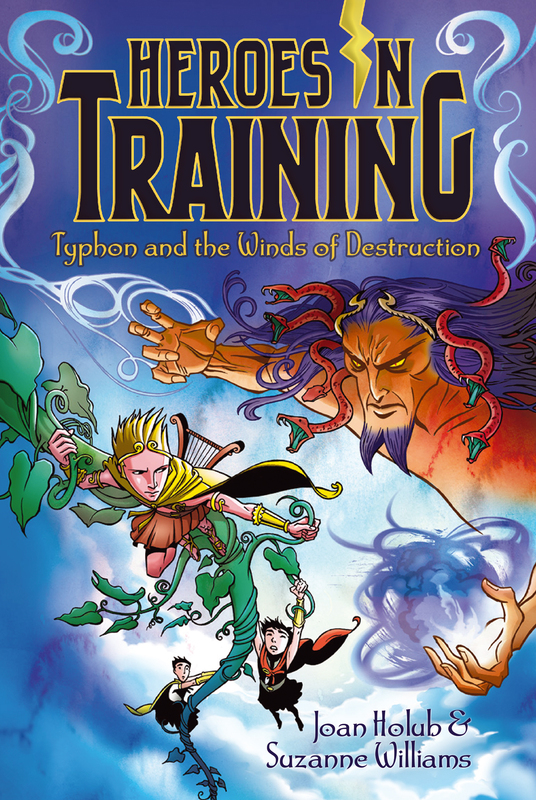 After battling fireball-throwing Titans, the young Olympians find themselves on a double quest: Not only must they find more Olympians that Cronus has swallowed, but they’re also in search of magic seeds that will help rejuvenate the earth after the terrible drought that plagued the lands, thanks to Hyperion. But a wind-throwing giant named Typhon has other ideas. Can the Heroes in Training withstand the storms that are coming their way? Ouch!” ten-year-old Zeus yelled as a hot orange spark hit his shoulder. She held up a long metal torch decorated with carvings. A bright flame danced in the shallow bowl at the top of the torch. “Well, maybe you should try a little harder,” Hera muttered under her breath. Zeus knew that Hera was upset. Yesterday he and his five young Olympian friends had found the Olympic Torch and its eternal flame. Hera had hoped the magical object would be hers. But the magic only worked when Hestia held the torch. He nodded into the distance. A tall green stalk with big leaves had sprouted up from the ground early that morning. The stalk had grown so tall that its top disappeared into the clouds. Pythia, the Oracle of Delphi, had sent them on a quest to find Magic Seeds, and the giant beanstalk looked like a good place to start. “Actually, I’m kind of hungry too,” Hades admitted. The other Olympians knew what he meant. Every time they went searching for a new magical object or a missing Olympian, they got into some kind of danger. Sometimes King Cronus of the Titans sent monsters to stop them. Or other Titans hurled fireballs at them, or tried to kidnap them, or worse. Sure, the giant beanstalk looked like a harmless plant, but Zeus knew by now that anything could happen. And when it did, it would probably be bad. Poseidon broke into a run. “Lunch, here I come!” he said, racing toward the farmhouse. The others took off after him. When they got to the farmhouse, they saw a gray-haired farmer pulling weeds from a scraggly-looking vegetable patch. “What are you kids doing all the way out here?” he asked. “We’d be happy to do a few chores to repay you,” Demeter said sweetly. “I can light your hearth,” Hestia offered, following him inside. Zeus looked around the yard. Brown and white chickens scratched the dry earth. Two pigs slept peacefully in a pen. A pile of logs was stacked against the chicken coop. “Let’s make ourselves useful,” Zeus said to the other Olympians. “I’ll chop some wood.” He took the dagger-size thunderbolt from his belt. “Bolt, large!” he commanded. The dagger sizzled and sparked, and then expanded into a five-foot-long thunderbolt. With Bolt he could slice through a stack of logs like they were butter. He had found the magic thunderbolt at the temple at Delphi, before he had even met the others. It had helped get him through a lot of dangerous situations. But it was great at doing ordinary stuff too. “I’ll fill the troughs,” Poseidon offered. He held up his three-pronged trident, which he had taken back from a Titan called Oceanus. That’s when he’d discovered that he was the god of the sea and could control water. Poseidon pointed the trident at the pigs’ wooden trough, and it instantly filled up with water. “I’ll clean out the pigpen!” Hades announced cheerfully, his dark eyes twinkling. Demeter wrinkled her nose. “Yuck! Why do you look so happy about it?” she asked. “Hey, you’re talking to the lord of the Underworld, you know,” Hades reminded her. “More like the lord of the pigpen,” Hera shot back. She still looked upset over that torch. Demeter tugged the sleeve of Hera’s tunic. “Let’s go feed the chickens,” she said. Thanks to the magical objects (and Hades’s love of smelly stuff), they finished the chores quickly. Then they took their seats at the large farmhouse table and dug into their lunch. He shuffled off into the other room, and Zeus nodded to Poseidon, who sat across the table. ”Oh. Right,” Poseidon whispered back. Demeter looked out the window at the farmer’s fields. Most of the crops had withered and turned brown, thanks to a Titan named Hyperion. He had been hurling fireballs across the land, causing a terrible drought, until the Olympians had stopped him. “Well, I just hope the right person gets the seeds,” Hera said, with a look at Hestia. “What do you mean?” Hestia asked, her light brown eyes wide. She stomped out of the farmhouse, her long blond hair swaying down her back. “Wow, she’s about as happy as a fish in a net,” Poseidon said. A loud scream came from outside. Zeus jumped up from the table and and ran to push open the farmhouse door. He and the others rushed outside. Three half-giants, who were as tall as trees, stood in front of the pigpen. The largest one grasped Hera in one beefy arm. She kicked and scratched, trying to get free. “It’s the Cronies!” Zeus yelled.